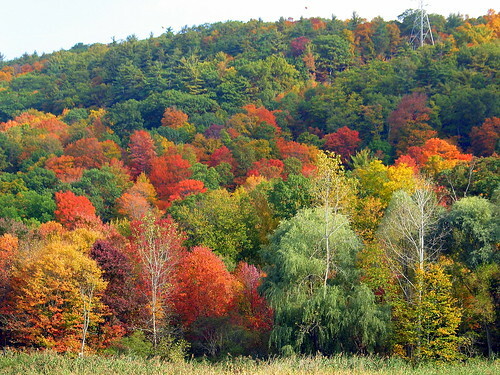 Leaf peepers come hither - the color is peaking soon! Really beautiful color. I can't come up there, so I'm hoping you'll keep me apprised of the color march! Is that a recent shot? We dont have such colour yet, soon though! Jenny, the colours are truly spectacular. A lovely photo!! I would say (judging from that power line tower visible amid the gorgeous hues) that this is the Indian Lake area, no? Once in my life I want to visit the Northeast for fall. Our colors are not even starting down here yet. Awesome picture. Oooh, ahhhh, fall colors! You live in a beautiful place. My, my, my. How vivid! My brother and his wife from Mississippi are driving up from Boston later this week, once she's finished with a convention. I wish I could be with them to see such colors in person. Thanks for the photo! The range of clours is astounding.